Our hotelrooms, P stars (form tourist office), are situed in the garten of Harfenmühle just behind the Restaurant.Theses rooms are equipped with hair dryer, TV, Alarm clock, shower and WC. Enjoy your stay in the nature in an idyllic location. You can find the price list here. This cosy guest room in country house style has a height-adjustable double bed and is suitable for 2 persons. There is a TV set in the room. There is also a bathroom with shower and toilet. Outside there is a furnished covered terrace. The idyllic location in the green allows you a relaxing holiday. This cosy guest room in country house style has a height-adjustable double bed and is suitable for 1 person. There is a TV set in the room. There is also a bathroom with shower and toilet. Outside there is a furnished covered terrace. The idyllic location in the green allows you a relaxing holiday. This family room is suitable for 4 persons. The cottage-style room offers a bedroom with height-adjustable double bed and TV set. In addition, the accommodation has a room with a loft bed, a dining table and a kitchenette. There is also a bathroom with shower and toilet. Outside there is a furnished covered terrace. 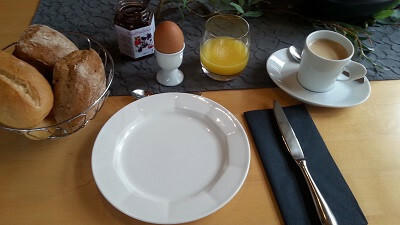 Continental breakfast from 8:00 till 10:00in the restaurant Harfenmühle. Breakfast is only available in conjunction with guest rooms.